In a standard enterprise application which has a database and graphical UI (web or desktop), there are some typical layers which constitute the application. In this article we will mention those layers and give some instructions about them. There are vertical and horizontal layers. Vertical layers may be thought as general application service libraries which can paralelly work on all horizontal layers and independent from each other. However, a horizontal layer's subject of interest is only its neighbour (top and bottom) horizontal layers, and they work sequentially from top-to-bottom and bottom-to-top. Lastly, user can only interact with topmost horizontal layer. Presentation: Every enterprise application has a UI, in fact graphical UI. This UI can be web or desktop based, which doesn't matter. The rule is simple. UI takes user action and sends it to the controller. And at the end it shows result taken from controller to the user. UI can be implemented according to MVC, MVP, MVVM or another approach. Control: Handles business logic of the application. Takes info from user and sends it to DB layer (DAO or ORM framework) and vice versa. Abstraction type of controller may vary (a separate control and business layers for example) according to the application parameters or development patterns (MVC, MVP, MVVM, ...) but the main idea remains the same. 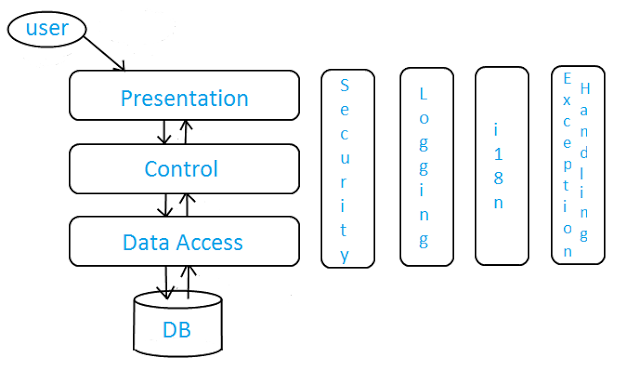 Data Access: Database handling layer of the application. It may contain entity definitions, ORM framework or DB connection codes having SQL sentences, according to the abstraction decision. Its role is getting data from controller, performing data operation on database and sending results again to controller (if result exists). Database independence is a very important plus for this layer, which brings flexibility. Security: Security is a general concept, which includes user authorization, user authentication, user role management, network or SQL injection attack prevention, data recovery etc but we grouped that items generally as "Security". Those issues must be handled for each horizontal layer if you want to have a fully secure software. Logging: Logging is very important for maintenance and reporting in enterprise applications. An easily configurable, parameterized, readable, flexible and correctly implemented logging layer for all horizontal layers is very useful for both developers and users. i18n: i18n (internationalization) brings multiple language support and user interface text changing capability without rebuilding code. It may also have localization property which can handle number, currency and date formatting. So i18n provides flexibility on appliations and should not be ignored. Exception Handling: Exception handling may also be included in "Security" or "Logging" layers. We should not use only general exception classes or absorb all exceptions if we want to develop a quality software. We sometimes need our special exception classes with their specific behaviours for better security, logging and application performance. If you design an architecture which has that layer structure considering software quality factors (which are told here), you will probably have a successful enterprise software application. Published at DZone with permission of Cagdas Basaraner , DZone MVB. See the original article here.